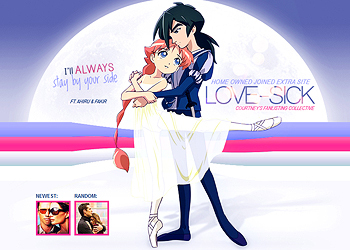 Featured in the layout are Ahiru and Fakir, my favorite relationship in the Princess Tutu anime series. I tried to make the layout very magical and dreamy, and I think it almost looks like a winter wonderland. Featured in the layout are Edward and Bella, the main characters from the Twilight Saga by Stephenie Meyer. I love this series, it is such a fun story, and has many interesting sub-stories within the other characters in the books. Featured in the layout are Chise and Shûji, the main characters of the anime ‘SAIKANO’. I’m not very a big fan of this anime or manga, but the pairing is cute, and, to me, almost tragic. I used very mute colors, which is a stark difference from the last layout which had rich colors, while these are more pale purples, pinks, and blues. 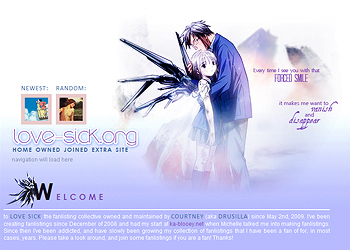 Love Sick’s first layout featured the two main characters from the novel & movie ‘Howl’s Moving Castle’, Sophie & Howl. 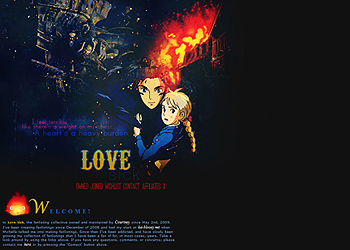 Along with Howl & Sophie in the layout, Calcifer was used in the text headers. The layout was very basic, but had a beautiful color scheme of deep golds, reds, and blues.